Home | Vitamins | Letter Vitamins | Vitamin B | Biotin (Vitamin B-7) | Ultra Biotin 7500 mcg. Biotin is a water-soluble B Vitamin, which cannot be stored in the body and must be consumed every day. 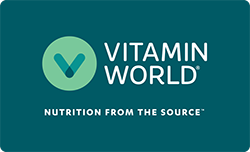 Vitamin World utilizes the most sophisticated methods to concentrate Biotin into a super high potency tablet. Other Ingredients: Dicalcium Phosphate, Vegetable Cellulose, Vegetable Stearic Acid, Vegetable Magnesium Stearate, Silicon Dioxide. Warnings: : If you are pregnant, nursing or taking any medications, consult your doctor before use. Discontinue use and consult your doctor if any adverse reactions occur. Keep out of reach of children. Store in a cool, dry place. Do not use if seal under cap is broken or missing. Ultra Biotin 7500mcg is rated 4.8 out of 5 by 6. Rated 5 out of 5 by Anonymous from Quality Love using this Biotin. Good quality to help keep my nails strong. Rated 5 out of 5 by Smiley from Notice results already! I've been taken them for a few weeks and I already notice faster growth in my nails! I really recommend these, I've been taken this brand for a while now, and I have nothing but good things to say! Rated 4 out of 5 by Hippygranny from Good product Helping my nails get stronger, still waiting to see if it helps my hair start growing again. I wasn't losing hair, it just stopped growing.